"Meet Robin Hood and his MERRY MENagerie!" 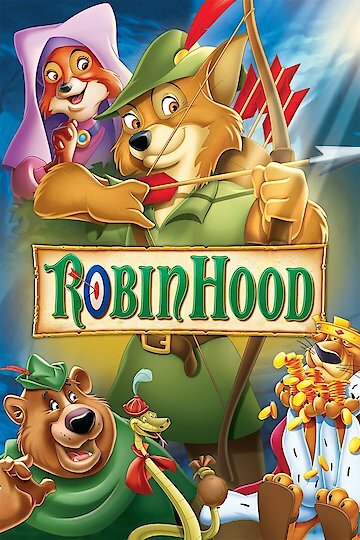 The animated story of Robin Hood set in the animal kingdom, with Robin Hood played by a fox, Little John a bear and Prince John a lion. Robin Hood steals from Prince John the gold he’s raised from illegal taxes and gives it back to the poor. Prince John suffers from mommy issues and jealousy of his brother Richard, the rightful king whose throne John has usurped while Richard is away on the crusades. Living in the woods as an outlaw, Robin pines for his true love Maid Marian, the niece of King Richard. Prince John and his right-hand man the Sheriff of Nottingham, plan an archery tournament in an attempt to trap Robin Hood. The winner will receive a kiss from Maid Marian. With growing taxes, the situation becomes dire for the villagers in Nottingham. Those who can’t pay are thrown in prison. Robin sees only one option: a jailbreak. Robin Hood is currently available to watch and stream, buy on demand at Amazon, Vudu, Google Play, FandangoNow, iTunes, YouTube VOD online.